Candy corn is one of the most polarizing candies out there, and I'm a candy scientist so I know exactly what I'm talking about. I have a few friends who love them and can't wait for Fall to roll around, but I find them overly sweet and waxy. I can still admit that they're a quintessential treat this time of year, so I found the perfect way to spread the candy corn love without subjecting my friends (and myself) to the originals. These candy corn cookies take my favorite rolled sugar cookie dough and transform them into a seasonal treat. I've already used the recipe for festive Christmas light cookies and jammy Linzer cookies, so the possibilities are endless. One of the reasons why I love these sugar cookies is because they hold their shape so well no matter how you cut them. I've heard rumors that it's because I use baking powder instead of baking soda, and chilling the dough is key too. The recipe is pretty standard: beat the softened butter and sugar together, add the eggs and a good splash of vanilla, then stir in your dry ingredients. Normally I'd chill the dough for an hour or two, roll it out thin, cut it into shapes, and bake it off. 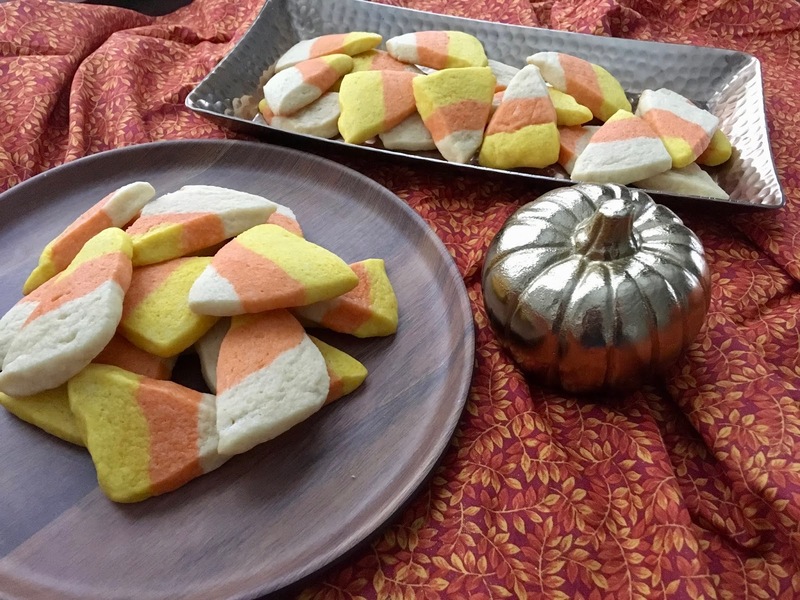 These cookies are slightly different, since it's much easier to layer the colors of dough than to painstakingly cut a million shapes. 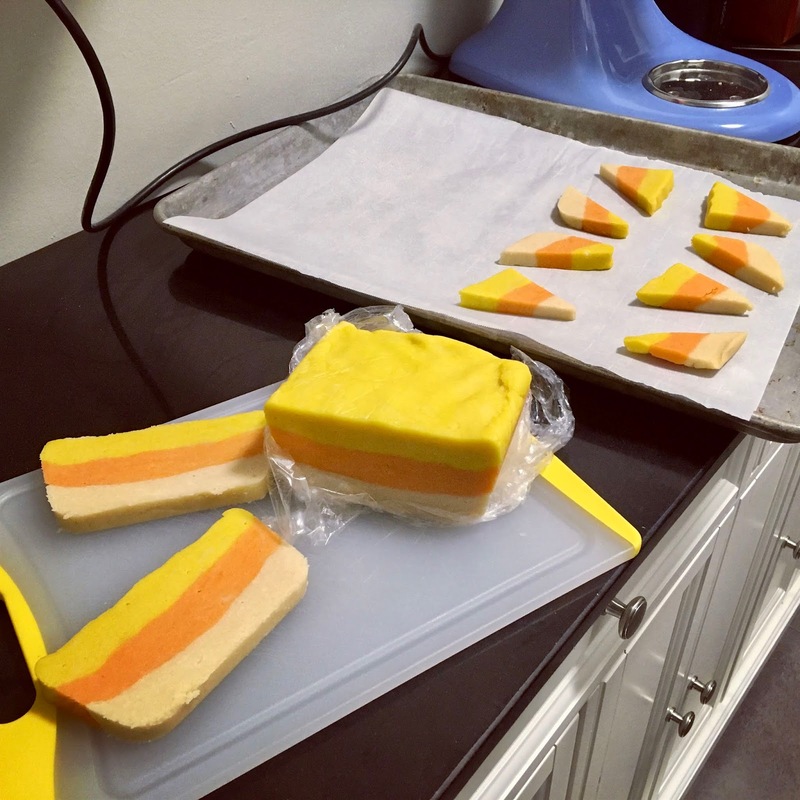 After the dough mixes, I split it into three sections and dye one orange, one yellow, and leave one plain. I had to use a lot of gel food coloring to get the bright colors just right, so don't be afraid to use more than you think. 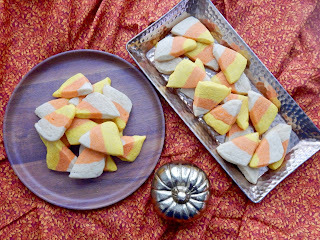 The trick to getting those signature candy corn shapes is to press the dough into layers, stack them on top of each other, slice them up, and cut each slice into triangles. I've found that a loaf pan is the perfect size to hold all the dough and helps keep everything even. It's best to let each layer chill for a few minutes before stacking the next on top so that there are clean lines between each color, but that's the perfect amount of time to mix the colors in to the next section. Once all the layers are stacked, they need to chill for at least an hour or two or you can leave them overnight. 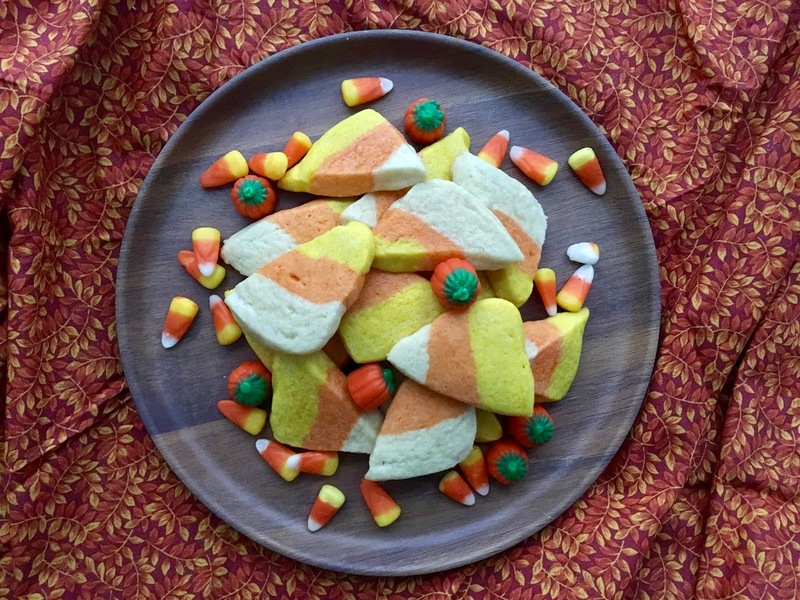 These cookies are the perfect portable Halloween treat. They even survived my commute to work on the wonderfully crowded Chicago bus system and were devoured by my candy science coworkers who were supposedly sick of Halloween candy and sugar in general. If you're looking to round out your Halloween party menu, try some brain cupcakes or mummy cupcakes too. 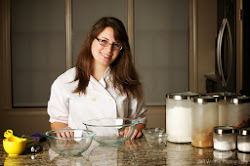 In the bowl of a stand mixer, beat the butter and sugar together. Add the eggs one at a time, then stir in the vanilla. Whisk the flour, baking powder, and salt, then gradually add it to the dough. Split the dough into 3 equal sections. Dye one orange, one yellow, and leave one plain. Line a loaf pan with saran wrap. Press the plain dough into the bottom of the pan and chill for 5 minutes. Press the orange dough on top and chill for another 5 minutes. Press the yellow dough on top, wrap with plastic wrap, and chill for at least 1-2 hours or overnight. Heat oven to 375ºF and line cookie trays with parchment. Remove the dough from the loaf pan and cut into 1/3" thick slices (1/2" is a bit too thick and 1/4" gives you crispy cookies). Cut each slice into triangles and transfer to the prepared trays. Bake for 8 minutes or until set and golden on the bottom. 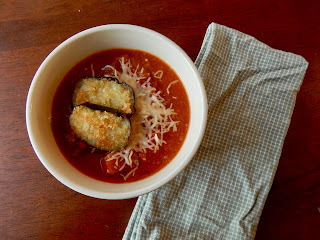 Eggplant parmesan is such a cozy dish, with all the hot, bubbly sauce and gooey cheese and the tender eggplant that acts as the perfect vessel to eat all that cheese and sauce. I've made it healthier with some quinoa and rolled the flavors into another tasty dish with some prosciutto, and now it's time for soup. This is the sort of recipe you can make on a chilly fall Sunday and eat for dinners for the week or bring in for lunch to be the center of attention at your office. 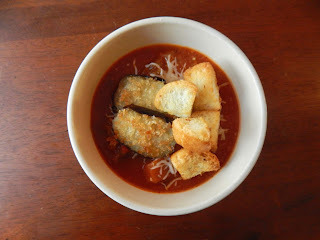 It's warm and velvety and full of veggies, and crunchy garlic bread croutons and plenty of cheese take it over the top. It starts by roasting the eggplant, which cooks down on cooking time later by getting it nice and soft and roasty ahead of time. You don't even have to cut it up, just prick it with a fork so it doesn't explode in the oven. I give it a rough dice when it comes out of the oven so it's in bite-sized pieces when it goes into the soup. Some of it continues to break down while it simmers but this is your once chance to decide on the texture so make sure it's small enough to eat but big enough to maintain some texture. 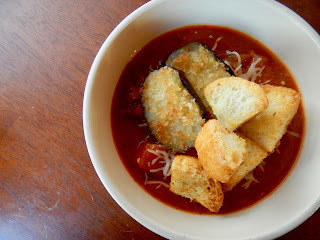 The eggplant goes into a big pot with some onions and garlic, a can of crushed tomatoes (a great tomato-y base for the soup), a can of petite diced tomatoes (or fresh, depending on the season), veggie broth, and herbs. There are a few key things that really make this soup great, so don't skip them. The first is deglazing the garlic and onions with white wine so you can scrape up all the tasty browned bits. When it comes to Italian cooking, white wine tends to give an extra punch of flavor that you can't really place but you know makes it so much better. I use petite diced tomatoes as well as crushed tomatoes for the perfect balance of texture since the crushed tomatoes are mostly liquid while the petite diced tomatoes are about the same size as the eggplant and offer additional texture. You could use regular diced tomatoes, but I find that they can be a bit large and awkward to eat. 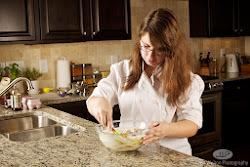 I use vegetable broth to make this vegetarian, but chicken broth would work equally well. Lastly, fresh herbs make everything better, so if you have them then throw them in. The soup only has to simmer for about an hour, which isn't that long for soup but still leaves plenty of time for the garnishes. My favorite is the garlic bread croutons, which are really just cubed up bread tossed with garlic and olive oil and baked until golden and toasty. You could sprinkle these on a bowl of water from the Chicago River and I'd still eat it. Yes, they are really that good. And of course no eggplant parm is complete without all the gooey cheese. I stir a handful of grated parmesan into the soup at the very end along with a glug of balsamic vinegar since the saltiness and acidity round out all the flavors. I also sprinkle mozzarella on top because everything is better with a cheese pull, one of the many lessons I've learned so far in Chicago. Heat oven to 425F and line a baking sheet with foil. Prick the eggplant with a fork all over. Transfer to the baking sheet and roast for 35-40 minutes or until soft. When cool enough to handle, split the skin, scoop out the pulp, and dice roughly. Heat some oil in a large pot over medium heat. Add the onion and cook for 3 minutes or until tender. Add 3 cloves garlic and cook for 1-2 minutes or until fragrant. Season with salt and pepper. Deglaze the pot with the wine, stirring to scrape up any browned bits, and simmer for 2 minutes or until reduced slightly. Add the eggplant, crushed tomatoes, diced tomatoes, vegetable broth, oregano, basil, and salt and pepper. Bring to a boil, reduce the heat, and simmer for 30-60 minutes. Meanwhile, whisk the olive oil, remaining 2 cloves garlic, and salt and pepper together. Toss the bread cubes in the oil, spread onto a baking sheet, and toast at 425F for 8-10 minutes or until golden and crunchy. Stir the parmesan and balsamic vinegar into the soup. Season with salt and pepper as desired, then serve with the croutons and mozzarella.